Regional governance is all the rage in some circles in America. But the Canadian experience demonstrates it might not have all the benefits advertised. More than a decade ago, the Ontario government forced six municipalities to amalgamate into the megacity of Toronto. This was not done by the residents of the six jurisdictions. Separate referenda in each of the municipalities (North York, East York, York, Etobicote, Scarborough and the former city of Toronto) all indicated strong disapproval. The government claimed that an amalgamated Toronto would be more efficient and that the city would be more competitive. More than $300 million was to be saved, according to the accounting firm hired by the government to study the issue. Early on it was clear that the efficiency claims were bogus. University of Western Ontario urban policy expert Dr. Andrew Sancton quickly raised questions about the analysis, pointing out that the harmonization of labor contracts and services among the six jurisdictions could only lead to higher costs and higher taxes. Things have only gotten worse. 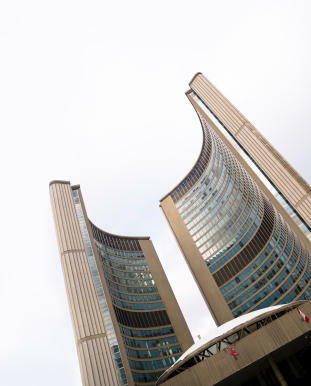 The city of Toronto budget increased in constant dollar terms and the $300 million in savings have long since evaporated. Meanwhile, there is no point in arguing that amalgamation made Toronto more competitive. Despite the impressive residential development in the core, Toronto’s growth rate has become anemic --- little more than one-half that of population growth whipping boy, Italy. Between 2001 and 2006, the first full census period after amalgamation, the city accounted for only five percent of the metropolitan area’s population growth. In the period immediately preceding amalgamation (1991-1996), the city-to-be accounted for 30 percent of the growth --- six times that of the more recent period. None of this is to deny that municipal amalgamations can produce economies of scale. They do --- for special interests, not the people. Large corporate interests find larger governments more susceptible to their influence. So too do public employee unions and other well-organized interest groups. As city hall is moved farther away, voters have less control over what goes on. There is not only a loss of income for taxpayers, but there is also a loss of community. Indeed, if larger local governments are more efficient, why not abolish municipalities altogether, or even provinces. Surely if all garbage collection were administered out of Ottawa, things would be better, to take the logic of the consolidationists to its extreme. Maintaining a sense of local community remains an important virtue. Equally critical, local governments have been proven to be far more cost effective and responsive. This is not just true in Toronto, it is true almost anywhere. There is good reason why municipal consolidation is unpopular --- it costs more and it makes city hall more inaccessible. This is the principal reason cities forced into Montreal fled when given the chance. It is why municipal consolidation has led to demonstrations this year in the Australian state of Queensland. Where the scale of government is bigger, people are smaller --- something the centralizers never seem to understand. Editor's Note: "One Bay Area Plan" is an exercise in the consolidation of Bay Area government functions under an umbrella of a regional government. As planning functions, police and safety, transportation planning and land use gets taken over by MTC or another regional entity, citizens will have their power over their neighborhoods stripped away. We must Save Marin.